Preheat oven to 450*F. Line 2 a baking sheets with parchment paper or foil sprayed lightly with oil and set aside. In a large container combine apple cider vinegar, worcestershire and salt. Add the fish and then enough water just to cover. 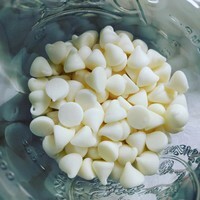 Allow to sit at room temperature for 15 to 20 minutes. Place in a single layer on prepared baking sheet, sprinkle with steak seasoning, and broil for 5 to 8 minutes until the flesh is opaque and flaky. Toss the potatoes with 2 Tablespoons olive oil, salt, and pepper. Then place in a single layer on prepared baking sheet. Bake about 20 minutes until edges start to crisp. In a medium pan, warm remaining olive oil over medium heat. Add the garlic and stir for 30 seconds, then wilt in the spinach and cook until tender. 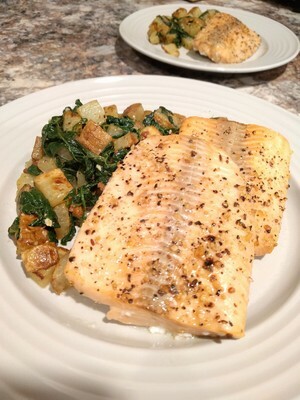 Toss the potatoes with the cooked spinach, then lay the fish over a big scoop. Serve with a splash of lemon juice if desired.